When I was in high school, my family traveled to Salzburg, and we looked up to those same breath-taking mountains, their ancient peaks covered with snow. Maria grew up in and loved the mountains, and she read that Psalm verse as a declarative statement; she looked up to the hills, because she believed her help was coming from them. In the hills, in the mountains, she experienced the presence of God. It’s an ancient idea, that we can get closer to God on a mountaintop, but that’s not the only way to read the Psalm verse. Modern translations like the Revised and New Revised Standard Versions and the Common English Bible end the phrase with a question mark. We all have words we carry along with us because they helped us in the past, expressions or verses or quotations that seem to sum things up just the right way. Our grandparents learned them by heart, but we don’t memorize on purpose so much nowadays. We’re more likely to see quotes laid over images passed around on Facebook or re-pinned on Pinterest. If we read them enough, maybe they stick in our heads. In my head, I hear a lot of scripture, especially the Psalms, in the King James Version of my childhood, this one just like Maria’s translation from the German. My copy, as the inscription testifies. 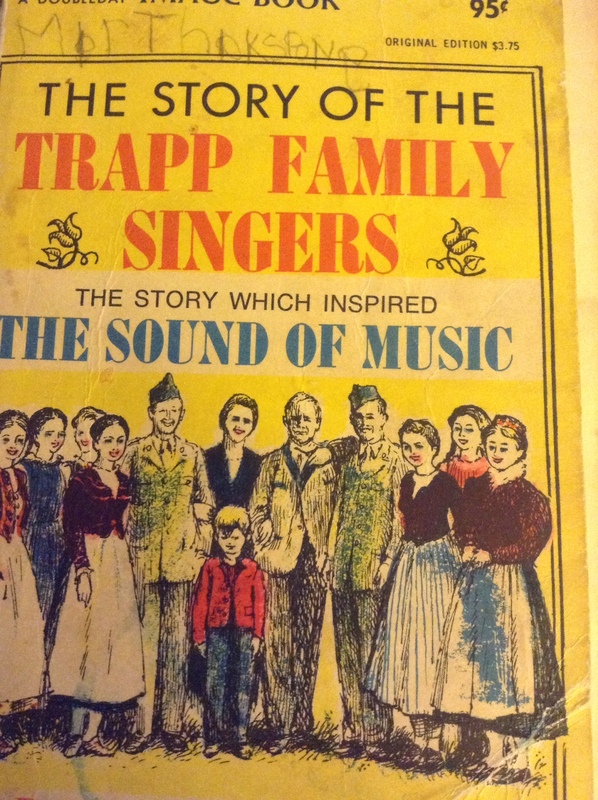 I grew up and went to college and got married and had a family, and everywhere I went, I took that copy of “The Story of the Trapp Family Singers” with me. Now tattered by love, it sits on the bookcase I turn to most often, just behind my desk. It is full of incidents where misunderstood language plays a part. The family comes to America on a concert tour and has trouble understanding the customs and slang and regional accents. As a little child, I didn’t get all the humor of those stories, but I remembered the things important to a child: the children proposed to her for their father; part of their house in Vermont collapsed; when the Captain was dying, they sat around his bed singing. 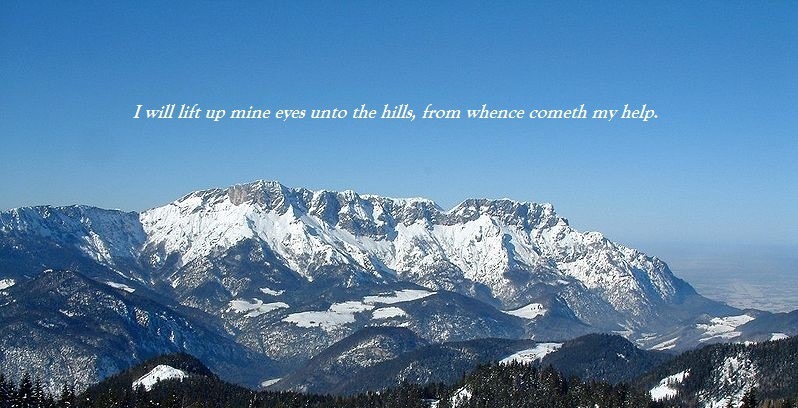 And I remembered the Psalm, quoted in the movie version, too, before they go over the Alps to safety. My daughter reminds me that every time we see the movie, I tell her they misinterpret that verse. Where is the question mark? No question marks later in the Psalm, though, none at all. The verses of this Psalm, in their Hebrew form, would have been well-known to Nicodemus, a Pharisee. In a primarily oral culture, he formed part of the minority who could read the Holy Scriptures. On the night he went to visit Jesus, he needed all his sources of courage. His peers already had a grudge against Jesus, who in the previous chapter announced his arrival in Jerusalem by turning over the tables in the Temple and accusing the religious leaders of turning his Father’s house into a marketplace. It’s important to note that in John’s gospel, unlike the other three, this happens early in Jesus’ ministry rather than in the days before his arrest and crucifixion. It is the opening round of Jesus’ conflict with those in authority. That includes Nicodemus. He comes to Jesus by night and in secret, not only concerned that his compatriots will find out, but also likely wondering whether Jesus will welcome him. Still, he comes. He trusts in God, who the Psalm tells us will not fall asleep on the job. God will be with us all the time. God will take care of us, protecting us even from the elements. We don’t usually think of the moon as something that could strike us. In the King James, the word is “smite!” When would the moon smite us? Then think of Nicodemus, trying to get to Jesus. It could happen when we don’t want to be seen in its reflected light. And he comes with respect, making the claim that Jesus must be a teacher come from God. Have you ever played the game where you choose three historical figures you would want to meet at a dinner party? As a good Christian girl, I always felt like I had to say Jesus before Jane Austen, and definitely before Maria Von Trapp, but the truth is I would probably rather meet Jesus by night, with no one else to bear witness if I couldn’t understand what he was saying to me. It’s easy to do that when we only listen to one version, or read only one verse. Our help cometh from the hills, right? Our help cometh from the Lord, who made heaven and earth. Like Nicodemus in the night, we search these scriptures looking for the thing we can understand. When we find it, we breathe deeply, relieved. We encapsulate it by chapter and verse in signs held up at sporting events, in the eye black on football players, on bumper stickers and refrigerator magnets. Some use it to further divide the “in” and “out” groups. But that all came later in a determined human attempt to make a spiritual truth take a literal form. In that moment, when Nicodemus came seeking the light in the darkness, Jesus didn’t outline how we should pick teams later. He simply said how much God loves everyone. For God so loved the world that Jesus came to be with us, not to judge the world based on human measurements of belonging and acceptability, but to save the world. 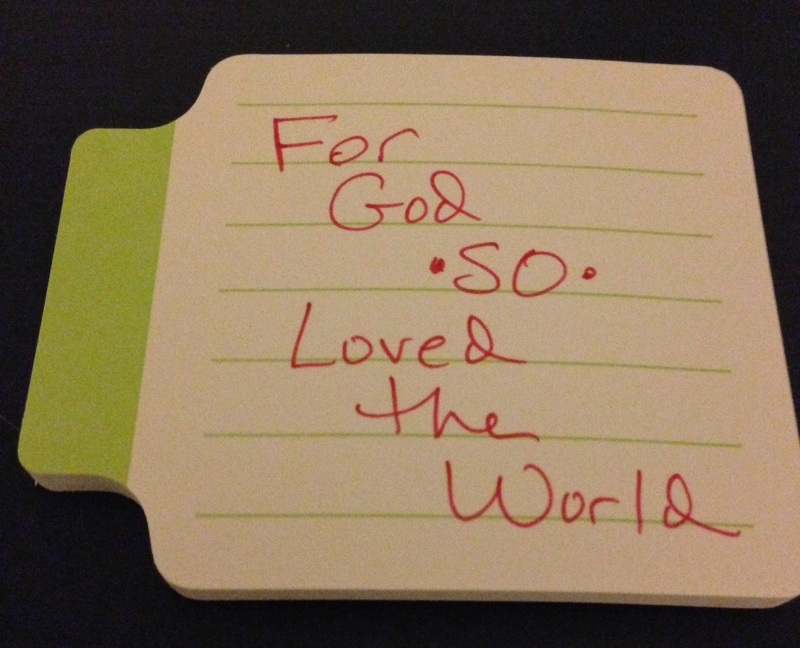 God *so* loved the world. Maybe that’s the part Nicodemus remembered on his way home, keeping to the darkest streets in Jerusalem, hoping no one would notice him. We know God kept him safe that night. Nicodemus appears in John’s gospel twice more, first in chapter 7 where he reminds the other religious leaders that their own law forbids judging a person without hearing his case, and then at the end of chapter 19, where he comes in broad daylight to bring myrrh and aloes needed to prepare Jesus’ body for burial. Our help comes from God, who loves the world so much that part of God’s own self came among us in Jesus Christ. God loves us so much that we have been offered new life in the Spirit. God did this not to divide us into teams or set us up for arguments about translations and question marks. God did this out of love for all people – love then and love now.